We love Pocket Packs and we think you will too. Pocket Packs are ideal for staff, volunteers and family and now it's easy to have them available for everyone. This bundle includes four of each of the five Pocket Pack activities - Match the Suits, Dice, Expressions, Strip Puzzles and Photo Cards - a total of 20 Pocket Pack activities all at a discounted price. To add variety, the four Expressions, Strip Puzzles and Photo Cards included in the bundle are all different. See the article "Pocket Packs - A Multi-Purpose Activity Set" for ideas on how to get the most out of Pocket Packs. Simple, but fun, Pocket Packs are small and self contained. They can be kept with you at all times to be used any time you want to engage a person quickly and easily. And the best part is that once the person is familiar with the activity, they can be left on their own to do it. They are great for front line staff to have in their pocket, ready to use any time a resident needs engagement. A great activity for almost anyone with dementia or Alzheimer's. Ready, set, _ _", "Hip, hip, _ _ _ _ _ _", "Don't sit under the _ _ _ _ _ tree", we've heard and used these expressions all our lives. Because the reaction to the clue is almost automatic, this activity will surprise you by the responses it draws out from the most unexpected people. 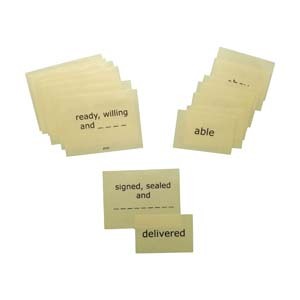 The Expressions Pocket Pack is a fun and rewarding activity for people with dementia or Alzheimer's that can be used any time with no setup - even while walking down the hall or while doing other work. Each of the four included sets are different. It seems simple, but in addition to the dexterity required to roll and handle the dice and cards, this fun and challenging game requires both math and reasoning skills. 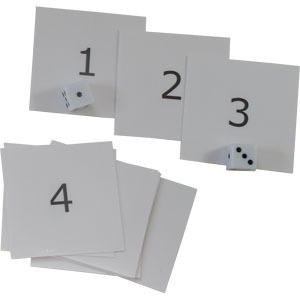 The person rolls a pair of dice, then uses the numbers shown either individually or by adding them together to decide which of the numbered cards to turn over. To make it a little easier, the game can be played with one die and the numbers one through six only. Match the cards according to their type, pick out your favorites, or just pick up a card and talk about it! 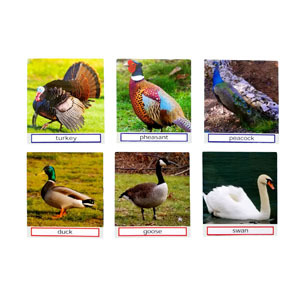 Match the Photos is a fun and easy to present activity that uses vibrant images in a variety of engaging activities with cognitive benefits. 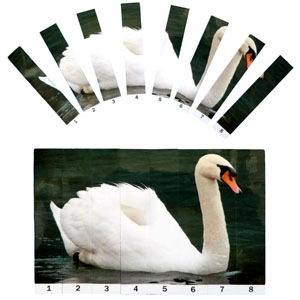 The Strip Puzzle Pocket Pack is a variation of a standard jigsaw puzzle. Instead of pieces that interlock, the numbered strips fit together side by side. It is much easier than a jigsaw puzzle but still gives the puzzle-lover the excitement of revealing the picture. It is suitable for people with mid to late stage dementia. 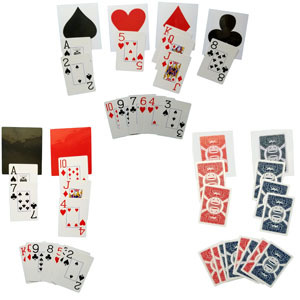 A subset of our full Match the Suits activity, this Pocket Pack includes a set of 13 playing cards and four laminated templates. Put the red and black templates on the table, hand the person with dementia or Alzheimer's the set of cards and they'll be sorting them in no time. Turn the templates over and sort by suit. Lots of variety and quick engagement with familiar materials.